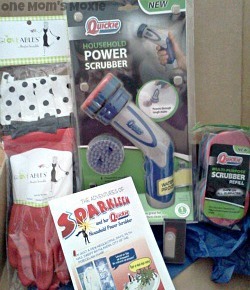 Since it's time to start Spring cleaning, I was excited to try the Quickie® Household Power Scrubber. The company Quickie® sent me a nice box of goodies which included the power scrubber, cute gloves, extra scrubber refills and a 1GB USB. I was ready to get to cleaning and trying out my new cleaning tool. With my fibromyalgia sometimes cleaning can be difficult, but after just a minute of using the power scrubber I noticed how well it worked. It's nice to know I can clean without the struggle. My first place to try the power scrubber was in the kitchen sink. We have an older sink and some of the grime just doesn't want to come off. One cleaning tip that I use it to spray the area with cleaner (I always use LYSOL) and let it sit for a minute before using the power scrubber. 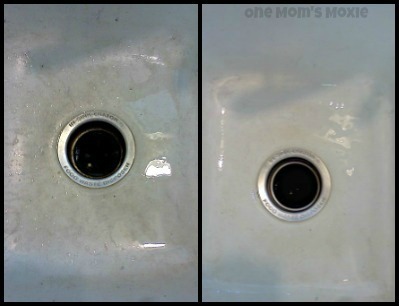 So I used the scrubber and here is my kitchen sink before and after! After try the Quickie® Household Power Scrubber on both the kitchen sink and the counter I am very impressed. I actually LOVE this easy to use handheld power scrubber. No more achy hands from putting a bunch of pressure to scrub anything. I can't wait to try the power scrubber in the bathroom. 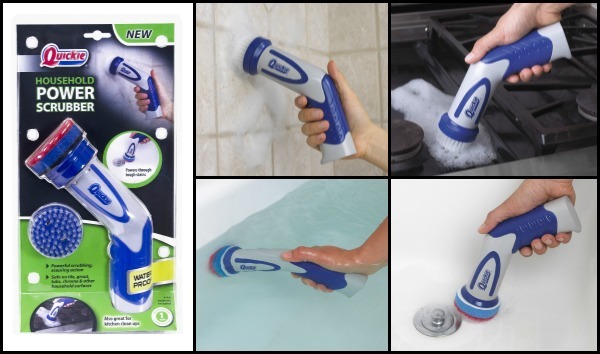 You can follow Quickie® Household Power Scrubber on Facebook and to purchase the power scrubber visit the Walmart website.